Classic Caning & Upholstery of Butler Wisconsin! Just a reminder that we are on facebook so please visit our facebook page and let us know what you would like to see. In this economy it is important to remember that Fair and Honest pricing with Quality workmanship is important to every project . Keep the furniture you love and make it new again﻿. Older furniture and even today, custom furniture is made with hardwood frames, Dowel joints not just glue and staples (maybe staples). It was a frame made to last. Your 1950's, 60's,70's. furniture was made by trained oldworld craftsmen. People who took pride in what they were making and selling. While reupholstering your old chair or sofa could cost as much as a new one, the frame will outlast most of todays mass manufactured new furniture. Best of all You can choose your own fabric. 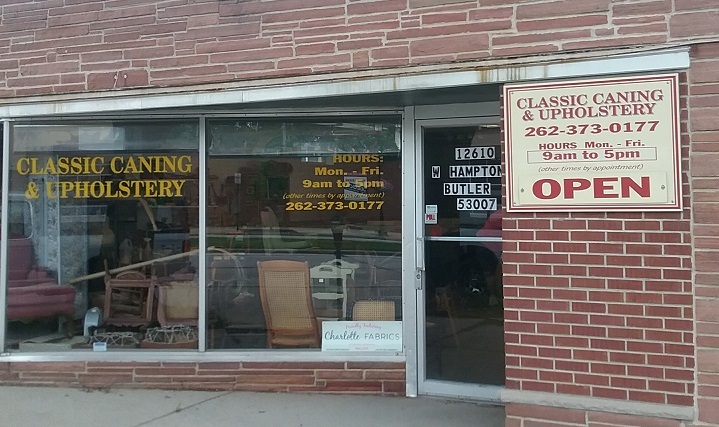 Classic Caning & Upholstery has been doing business since 1999. Conveniently located near Brookfield, Milwaukee and Menomonee Falls from beautiful downtown Butler Wisconsin. Commercial, Residential, Marine, and Motorcycle. We will come to you or you can bring your project to us. We reupholster small jobs as well as large jobs.